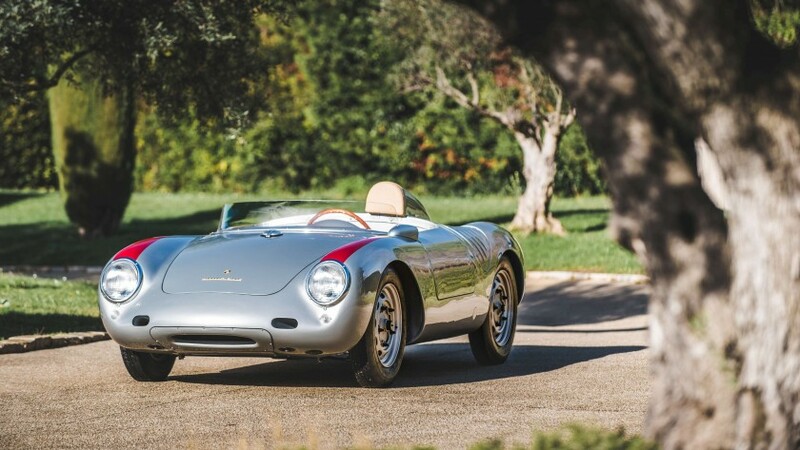 Most important Porsche that is offered for sale in the Artcurial Auction at the Paris Retromobile Show is without any doubt the Porsche 550A Spyder (chassis 550A-0126). This Porsche 550A Spyder was shipped to Guatemala immediately after production to Hubert Wiese, an amateur racing driver. Jaroslav Juhan and Huschke von Hanstein shared the wheel of this particular car when it finished 10th at the Buenos Aires 1000 Km. During the 1958 season, Wiese won two more races in this car, at the Circuito Santa Anna and the Circuito San Benito (Salvador). He was crowned Champion of Central America following these latest victories and appeared in a Porsche advertisement promoting the marque’s success in competition. In 1959 the car was sold to French Robert Buchet. After the fatal car accident of Robert Buchet, the Porsche 550 Spyder was sold to another French collector Raymond Touroul. The car remained 10 years in this collection. This car comes with a history file containing various expert reports and recent invoices relating to the restoration. Seen the importance of the Porsche 550 Spyder and the fact that is has some French provenance, we think there might be a strong interest for this particular car. However, keep in mind there is another Porsche 550 Spyder (chassis 550-0082) on the auction market at the RM Sotheby’s Auction in Paris too. We’ve told you about the 1950 Porsche 356 that will be auctioned at the Bonhams Auction in Paris. Well, there is another Porsche 356 pre-A (chassis 60205) coming up for sale. This 1953 Porsche 356 pre-A was delivered new to the United States in 1953 in the Porsche color of Azur Blue with a leather interior. Paul Wesselink who ran a pawnshop in Huntingdon Beach started to restore the car in the late 90s. In 2004 the car was sold and shipped to the new owner in Australia, where it was stripped and painted in its current black color. The car hanged more hands in Australia before it was shipped to the current owner in Germany. This matching number Porsche 356 pre-A is worth to find a new owner, and we believe it will bring more than the estimation set by the auction house.